Supporters of the spiritual leader of Iraq's Shia Muslims, Ayatollah Ali al-Sistani, have denied reports that he has been the target of an attack. One of his aides dismissed the reports as untrue. One report had said gunmen opened fire as he greeted people in the holy city of Najaf on Thursday morning. 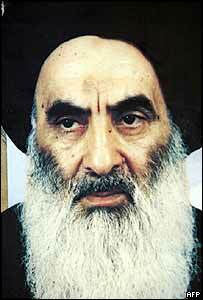 Ayatollah Sistani has recently criticised US plans to transfer power to an unelected authority in Iraq, and called for direct elections. The reports came a day before the expected arrival of a United Nations mission in Iraq aimed at resolving the issue. Ayatollah Sistani has rejected the US plan - agreed with the US-appointed Iraqi Governing Council (ICG) - that allows for the transfer of sovereignty to a provisional government in June. This government is supposed to draft a provisional constitution. A Sunni IGC member had denounced the reported attack on the spiritual leader. "This horrible act aims only to divide the Iraqi people but it will fail," said Naseer al-Chaderchi.